Celadoncvo posted a message on What's your funniest Dungeon Run moments so far? Chronomancer Inara's OTK (Archmage Antonidas and the spell that makes your other spells cost 0) vs Wax Rager results in almost a soft lock. She will only ever target Wax Rager with Fireball. Fortunately, the turn ends after about 15ish minutes of this lol. 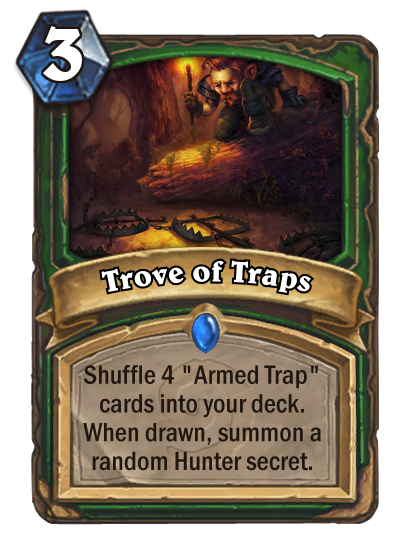 For the pace that hunters can draw through their decks, this could push out a lot of secrets in one turn. Quite a gamble without excessive card draw, so it'd only really see use in the cycling decks (like quest hunter). Celadoncvo posted a message on Which was your 1st Golden Hero? Druid is my only golden hero at the moment. Mill/fatigue druid was the only thing I played for fun on ladder from Naxx to LoE. A lot of my other heroes are at about 350-400 though, primarily from one-off OTK decks or getting daily quests done. Anyone seeing this flavor text for Unite the Murlocs? Mechafin would be a really cool dual tribe card if they ever did those. Pretty odd card but since shaman's win-more effects require minions on board (even your 0 attack totems), this card is a lot more dangerous than it looks. Murloc Tidehunter is also a solid turn 2 play in a murloc deck, but in some matchups you risk getting swept by things like Ravaging Ghoul or Maelstrom Portal. It's a really strong option to keep your murloc decks from having the same, predictably vulnerability to 1 damage board clears. It probably won't make every murloc deck, but given the other 2-drops available for murlocs, this is a good one. This card is pretty on par with other face snowballers like Flesh-Eating Ghoul and Raging Worgen. It can at least keep itself alive with +3 health, untargetable, stealth, or divine shield! It's Preparation for warlocks. That's pretty powerful when it turns their expensive removals and board clears into tempo turns or cheats out a Kara Kazham!/Feeding Time on turn 2. We complained that Stormcrack was absolute trash because it wasn't as good as Crackle. Stormcrack saw a lot of play, and there's reason to expect this will too, given how powerful Imp-losion was. Yes, it competes with Bane of Doom, but the consistency of 3 1/1s is probably on average better than Bane of Doom's expected statline. It looks really underwhelming but having a free 3 damage saved up (or more with Deadly Poison) is great for combo cards and burst in general. You don't have to rely on holding a Wicked Dagger all game, and it's about the same power as Assassin's Blade which saw use in oil decks. There's probably not enough synergy for this card yet without any new weapon buffs, however. At 2 mana this would be obscenely powerful, where you would be almost guaranteed a card on the power level of a class 2- or 3-drop. At 3 mana, we have other options that are 3/3 but conditional like Thunder Lizard and Vicious Fledgling. Really just a card that fills out the adapt theme. I don't think we want to see another Haunted Creeper superstar if we want to keep our sanity. Obviously geared towards a token deck, but probably a little too fragile for that. North Sea Kraken was released in the Grand Tournament, before the Year of the Kraken had even been conceived. We did, however, get some kraken lookin' old gods particularly with N'Zoth. 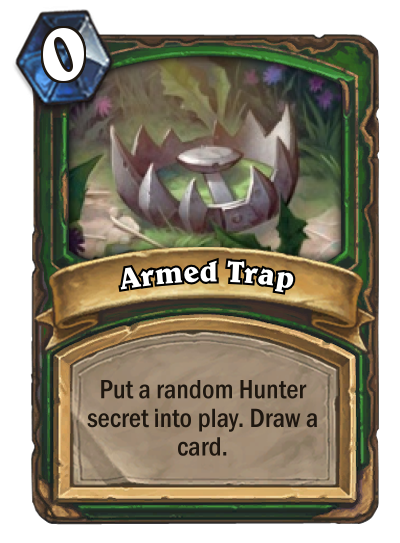 You can curvestone a ramp deck these days with an aggressive mulligan and Hemet, Jungle Hunter to cut out the remaining early game specific cards left in your deck. Turns 1-6 look like Jungle Giants > Tortollan Forager > Elder Longneck > Bright-Eyed Scout > Card drawn from Bright-Eyed Scout > Hemet, Jungle Hunter. It doesn't require you to sacrifice cards for ramp, and you can still run Nourish and Lunar Visions for card draw. I was thinking only about myself with a vote on bad, but you've made my vote go to meta-defining. Timmy deserves some awesome dinosaurs. Really slow, but really high long-term value. You can bait out weapon removals with Truesilver Champion and Tirion Fordring at least, but the deck looking to spam a bunch of Silver Hand Recruits for buffs probably doesn't want to wait until turn 7 to start. In another comparison, this is a lot like Justicar Trueheart who lets you spam out a bunch of guys. Not permanent, but the higher and faster damage output a 4/3 weapon compared to a 6/3 body is really significant.